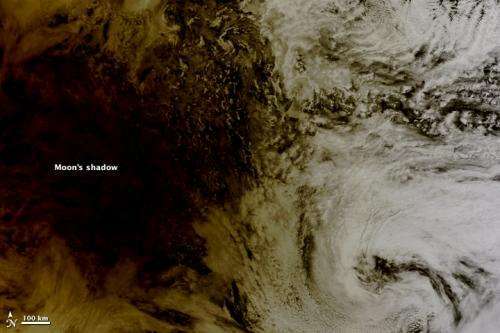 As the annular eclipse on May 20 sent skywatchers around the globe gazing upwards to see the Sun get darkened by the Moons silhouette, NASAs Terra satellite caught the other side of the event: the Moons shadow striking the Earth! Cast across 240,000 miles of space, the lunar shadow darkened a circular swatch 300 km (185 miles) wide over the northern Pacific Ocean in this image, acquired by the Earth-observing Terra satellites Moderate Resolution Imaging Spectroradiometer (MODIS) at 20:30 UT on Sunday, May 20. Where the Moon passed in front of the Sun, Earths surface appeared black (left half of image). 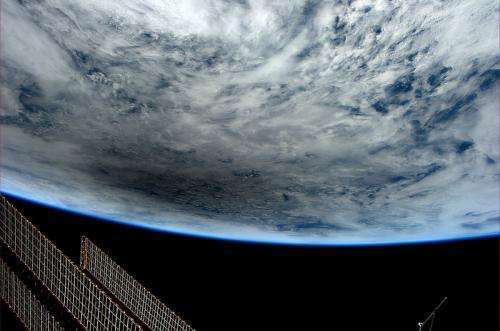 Around the margins of the shadow, our planets surface appeared yellowish brown. The shadow cast by an eclipse consists of two parts, the completely shadowed umbra and the partially shadowed penumbra. Although there were a few images being circulated online of the eclipse that were not actual photos, be assured that these are the real deal. And the next eclipse event? That will occur on November 13 of this year, when a total eclipse will be visible from Australia, the South Pacific and South America. Watch an animation of the Nov. 13 eclipse visibility here.